“I don’t care that they stole my idea. I care that they don’t have any of their own,” said Nikola Tesla. Few men have had as great an impact on the modern world as Tesla. He came from humble beginnings. As the son of an Orthodox priest, it seemed very few options were open to him. Early on, it looked like he would have to choose between priesthood and the military. However, Tesla had other ideas. In school, he was an excellent student and could perform calculus in his head. When teachers saw he did not show his work, they thought he was cheating. Nevertheless, his abilities proved useful in changing both his future and shaping the modern world. Tesla worked for a phone company in Budapest and soon was elevated to the position of chief electrical engineer. He then went to work for the Continental Edison Company in France, working on improving both the design and efficiency of electrical systems. He then transferred to New York City and was hired to work directly for his idol, Thomas Edison. He started out doing simple, mundane electrical tasks and soon moved on to more complex problem solving. During his employment for Edison, Tesla was hired to redesign Edison’s direct current (DC) generators. Edison offered Tesla $50,000 if he could make the generators more efficient and reduce operating costs. Upon completing the given task, Edison went back on his word, saying he had been joking and offered Tesla a measly ten dollar raise. This is yet another example of a right hander screwing over a left hander! At that point, Tesla quit and began working, saving money to start his own lab. It took him a year, but Tesla saved enough money, and coupled with an investor’s money, was able to open his own facility. Tesla invented and patented several alternating current (AC) devices including motors, generators, transformers, and transmission lines – just like the ones used today. Both Edison and Tesla believed their form of power could illuminate the world. Edison was an advocate for DC and Tesla for AC. The problem with DC was that it could not be transmitted over long distances. Edison proposed building coal-fired plants a mile apart to power America. The level of air pollution created would have been unbearable! Edison tried to prove the dangers of Tesla’s AC by electrocuting animals and humans. In the end, Tesla developed a method of producing devices that allowed him to harness over a million volts. He even figured out how to surround and envelope his body with lightning bolts and suffer no apparent harm! George Westinghouse saw the potential of alternating current. His company, Westinghouse Electric agreed to pay Tesla a million dollars and $2.50 in royalties per each AC horsepower unit produced. Together, they lit up the 1893 Chicago World’s Fair. Eventually, Westinghouse Electric was awarded a contract for the Niagara Falls hydroelectric project that led to the electrification of America. Later, when Westinghouse Electric was over-extended financially, Westinghouse talked Tesla into releasing his company from the royalty agreement. Obviously, Tesla was a brilliant inventor, but a poor business man. 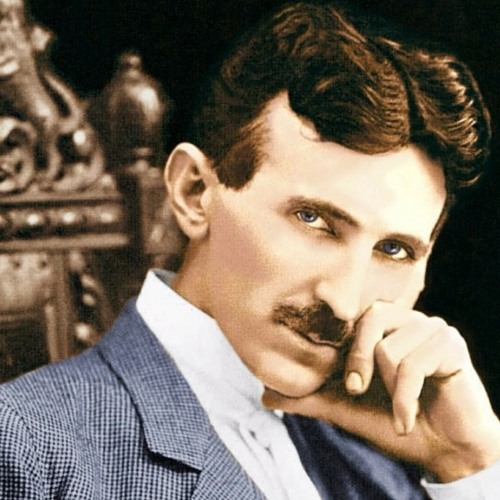 Tesla went on to invent x-rays, remote control, wireless technology, neon, and robotics. Tesla’s vision was to transfer unlimited energy around the world using high frequency. He was in competition with Marconi who was accused of using seventeen of Tesla’s patents to accomplish transatlantic broadcast. Court battles were fought and Tesla’s patents were upheld and then mysteriously overturned. Ultimately, Marconi won a Nobel Prize. After Tesla’s death, Marconi’s patents were stripped because of their similarity to Tesla’s design and because Marconi’s design used a Tesla coil. Nikola Tesla was a brilliant man: he spoke six languages and his inventions changed the world. Corporations and people got rich off his ideas. They dismissed him as a crackpot even as they benefited from his brilliance. Tesla set his sights too high; he went for grandeur when simple broadcast would have won the race. He did not comprehend the greed and avarice that surrounded him. Unscrupulous people, who used and abused him, only cared about personal profit and gain. In his later years, he lived by the generosity of others. He was allowed to live and eat free of charge in honor of who he was: a left hander so in touch with creativity and genius, yet so out of touch with protecting his ideas and interests. The world may never know what secrets were stolen after his death. One thing is certain: the world owes Tesla a debt of gratitude and recognition.